I never attempt to make money on the stock market. I buy on the assumption that they could close the market the next day and not reopen it for five years. It is a famous saying by stock guru Warren Buffet. It is known fact that equity investment for long-term gives a better return to the investors. However, it is a difficult task is to identify good stock for the investment. You need to collect a lot of information and do a research in order to find the best stock of a reputable company with good business potential. The chances are good that you will select the best stock which will come out as a winner and you will never have to regret your decision. But, it may be possible that a volatility and correction of the market does not allow your stock to perform better and you may lose your money. Don’t worry I have something special for you. Today I will be sharing details about 5 stocks that consistently beating the market and generating positive return since past three years. In addition to that, I will also give details about 20 stocks that performed consistently in past 20 years. These stocks are the strong bet for retirement perspective. Sounds interesting right, so without wasting your time let’s try to look at Top 5 Best Consistent Performer Stocks since past 3 years. Trident is Textile and Spinning Company. Trident is first best consistent performer stock. Once upon a time, Trident was a penny stock. Trident has grown multifold and given magnificent returns to an investor in several years. The stock was able to generate 72% return in past 1 year. Aarti Industries Limited is dealing in chemical and pharmaceutical business. This stock could able to generate very good wealth for an investor in past few years. In past one year this stock has generated 46% return. Essel Propack is tube packing company dealing in manufacturing of laminated plastic tubes for FMCG and Pharma space. This stock is giving consistent positive return to the investor. Last year this stock has generated 48% return to the investor. Blue Star is one of the largest air conditioning company in India. Blue Star is a consistent performer stock. In last one year, this stock has generated 75% return to the investor. Supreme Industries is one of the largest plastic processor based company of India. Supreme Industries is consistent performer stocks since several years. Last year supreme industries have given 46% return to the investor. Note – Above return calculations are Financial year wise April to March. 20 stocks that generated a consistent return for the investor since 1996 are Infosys, Aurobindo Pharma, ZEE Entertainment, Cipla, HDFC Bank, Dr. Reddy’s Laboratories, Hero MotoCorp, Rolta India, Pfizer, RIL, Tata Elxi etc. The data of 20 performer stocks given above is complied by Centrum Wealth. 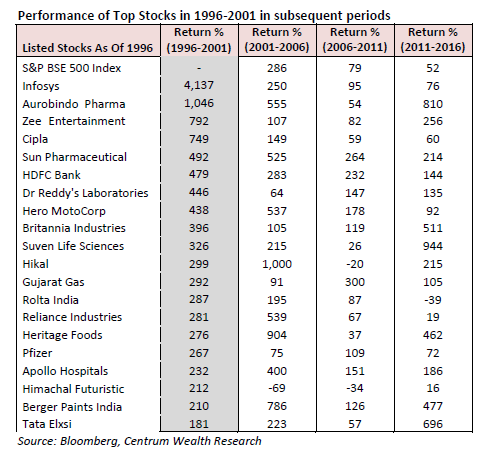 I have taken reference of 20 consistent performer stocks since past 20 years from Econmictimes. The data shown here is for illustration purpose only. « How RERA website helps you for home buying?